Work tops in the kitchen are very important to a householder looking to cook and prepare a meal. When buying a house or even renting, the first thing that people will look for is the design of the kitchen. For example, the colors that have been used and what condition the work tops are in. Depending on how many people are being catered for, this will determine how big it needs to be. Many people prefer to work on a workspace with a larger area in order to prepare their food, but some don't have the choice. Kitchen work tops need to be chosen and looked after well because of all the foods that are prepared on the surface, it can harbour many germs - sometimes even more than a toilet seat. This can be due to the amount of cross-contamination, such as raw foods being mixed with cooked dishes and also the state of the work tops themselves. If the work tops have cracks and scratches in them no amount of cleaning can make the work top clean enough to work on. The best way to reduce the risk of cracks and scratches is to make sure that when preparing food with knives, a chopping board is used. Chopping boards come in many different colors and sizes. The reason for the colors is so that the person preparing the food can define which boards are for what. This is particularly important in a kitchen workplace. When at home, people are usually cooking for people they know so there aren't really any rules as to what board to use. However, many people at home usually just use the same board as they don't make use of that many different food types whilst cooking one meal. And if they do, they will usually just clean it. 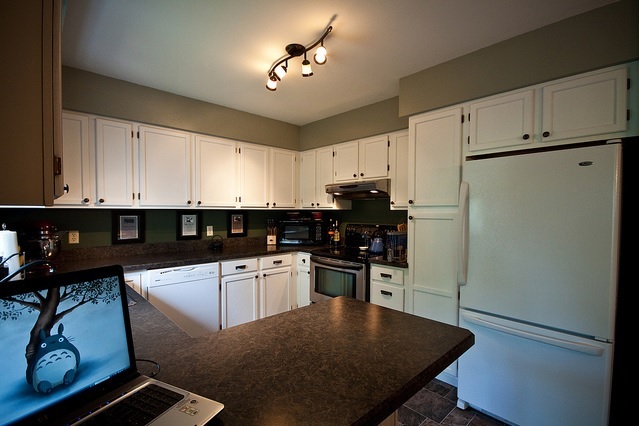 The colors of boards that are generally used in a kitchen are red, blue, yellow, green, brown and white. So there are six different boards, all helping to avoid contamination. The main three boards that should never be mixed up are the red, blue and yellow - this is because the red is for raw meat, the blue is for raw fish and the yellow is for cooked meats. If these raw and cooked meats are used on the same boards it can mean that people can get food poisoning, as if raw meat is eaten people can become ill. There are many types of worktops that can be chosen, all of which need to be kept clean and scratch-free. It is very important that the correct cleaning materials are used so that the varnish on the kitchen work tops is not ruined. This guest blog was written by Darrell Roberts, a kitchen designer who believes that the right kitchen worktop will make the whole kitchen look just perfect.